Almighty God, You know that I have no power on my own to help myself: Keep me both outwardly in my body and inwardly in my soul, that I may be defended from all adversities which may happen to my body, and from all evil thoughts which may assault and hurt my soul; through Jesus Christ our Lord, who lives and reigns with you and the Holy Spirit, one God, for ever and ever. Let them fear death who do not fear sin. So when He had washed their feet, taken His garments, and sat down again, He said to them, �Do you know what I have done to you? You call Me Teacher and Lord, and you say well, for so I am. If I then, your Lord and Teacher, have washed your feet, you also ought to wash one another�s feet. For I have given you an example, that you should do as I have done to you. Most assuredly, I say to you, a servant is not greater than his master; nor is he who is sent greater than he who sent him. If you know these things, blessed are you if you do them. Like yesterday's Scripture, today's contains two different parts: one, a section on washing feet, and one, a section about Judas Iscariot. As discussed yesterday, Jesus uses the washing of his disciples' feet to show the need for daily forgiveness, for the sins we have accumulated during the day. We are fully cleaned by baptism, when water is poured on the head or the entire body. However, due to our less exalted existence -- the existence of the body, symbolized by the feet -- we accumulate sin after our baptism. We are cleansed of this daily sin by Christ's love for us and forgiveness of us. Today, Christ tells his disciples that they are not greater than he is. Then he explains that, if he humbles himself to wash their feet, they should do likewise. 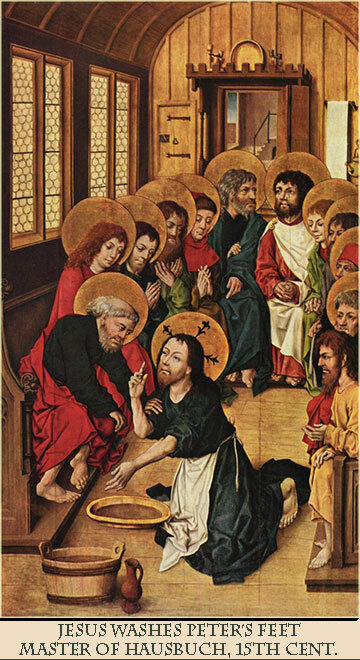 Christ is not literally telling them to wash each others feet (although a few denominations have encouraged this, as a sign of humility and love). He is telling them to do what he has done: To love and forgive one another, just as he has loved and forgiven them. If Christ, who is our Lord, can love and forgive sinful humanity, who are we to do otherwise? Are we superior to Christ?